The ‘Stories of Movement’ project began in 2018 with the idea of building community engagement across Highland, in a way that allowed different groups, services and individuals to come together from across the region. From this, the Stories of Movement project grew into a winter festival. 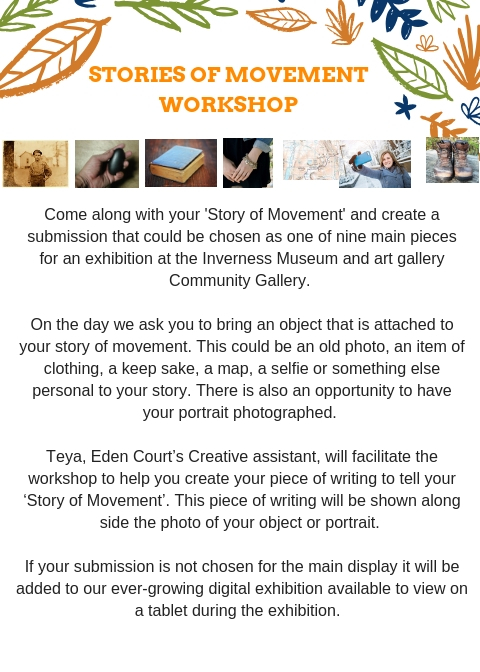 In December 2018 we had our first Stories of Movement event which was a Civic Reception at Inverness Town House. The reception involved wonderful performances and presentations as a way to show the diverse ways in which we embody and express our story of movement. 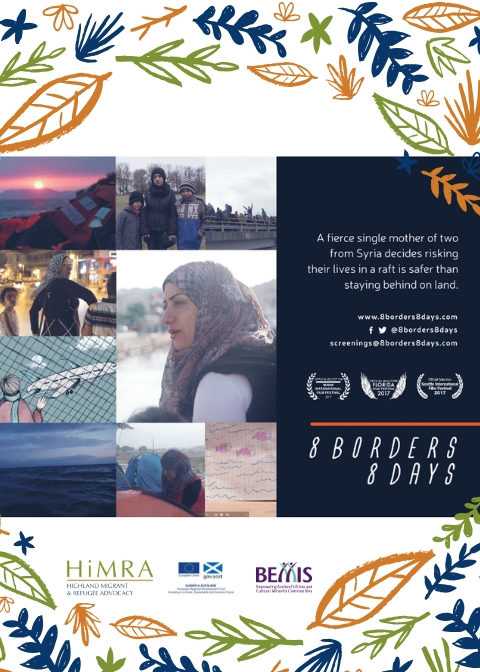 We then hosted a film screening at Eden Court Theatre and Cinema where audience members were shown two films and then invited to ask questions and discuss the themes from the films. Finally, in February 2019 we opened the Stories of Movement Exhibition at Inverness Museum and Art Gallery (IMAG). ‘Story of Movement’ was created with an aim to encourage the wider community to think in new ways about migration. The exhibition offers people an opportunity to reflect on the many and varied ways in which movement occurs and that, fundamentally, everyone has a story of movement. The HiMRA team would like to thank BEMIS and the Rotary Club for kindly funding our winter festival and making it all possible. We would also like to say thank you to the exhibition participants, Teya Jane Bawden and Mike Webster from Eden Court Engagement Team, Highland Print Studio and Alison Parfitt, Curator at Inverness Museum and Art Gallery, for their amazing enthusiasm and contributions that made this exhibition possible. Below is a gallery of every submission we have received for the Stories of Movement project. This is an ever growing collection that we want you to be a part of. To share your story please see the ‘Call for Submission’ information following the gallery or come to our Stories of Movement workshop on February 27th at 12:00 - 14:00 at the IMAG Room for Discovery. 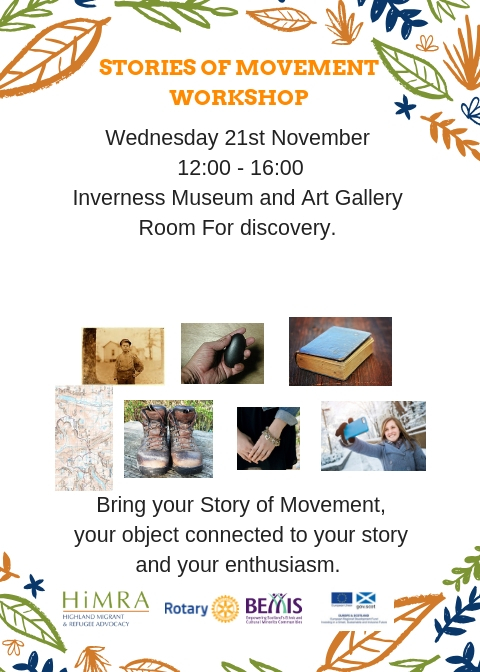 The Stories of Movement exhibition will be on display from February 6th until March 16th at Inverness Museum and Art Gallery. There wasn’t a life in Syria any more – everything was destroyed. I left Syria about 7 years ago, after some very bad things that had happened there. I was captured, with my brother, by the military for twenty days during which time we were tortured and abused. Our family mediated our release and had to pay a lot of money. My mother told us to flee the area because it was no longer safe for us to stay, with the shooting and the airstrikes. Before the borders between Syria and Lebanon there was a checkpoint, where they would stop any vehicle for ‘checks’. They took my brother, and then he disappeared. The news came recently that he’s been killed. That day they only kept me for a couple hours before releasing me, so I continued my journey. I made it to Lebanon but three months later I heard that they had taken my dad the same way. No news. Nothing. My dad was disabled and 70 years old and they took him. I was engaged at that time and I managed to bring my fiancé to Lebanon. There wasn’t a life in Syria anymore – everything was destroyed. After a year she passed away. There wasn’t any good care there. The hospital charged me $20,000 and I had to borrow this money from my friends. I struggled on for months, with a little baby; I was a dad and a mum. I met my current wife and after we married we registered with the UNHCR for immigration. They heard our story and asked us if we would travel, we said yes. The harder things started at Glasgow airport. When I came here I felt very sad. Happy and sad. I had left my mum there; my friends were still there too. I had a good life before the problems began. We’re all two disasters away from homelessness. I was one of life’s gypsies. I’ve lived in several countries and worked in even more: as far flung as the Falklands to the Middle East and places like that. I have a knack of getting out of places just in time. I left Tabuk, in north western Saudi Arabia, on the 26th of June as Sadam Hussein invaded Kuwait in the August. In 2008 I was living with a girl in Brighouse, in Yorkshire. She got addicted to cocaine. As you can imagine, I left that with just about nothing: virtually on the streets and I needed something. Mike, my friend who taught me the magic, knew of a job that was going up here so I ended up spending 15 months in the caravan. Which was interesting in 2009/10/11. It got to -18C. I wrapped up well, and I didn’t spend the whole time in his caravan. I got my own caravan after a while, but I modified it. I built a bed about 4ft off the ground, because the higher up you go inside a structure the warmer you’ll be. I curtained it off so that all I had was this little space, about 7ft long, to keep warm. The rest of the caravan could be as cold as it liked but as long as that bit was warm I was okay. I had about 30 tog quilts on it and just about all the clothes I could get on. I was going to bed and my duvet was frozen where the condensation was on it. When I woke up in the morning it was still frozen. Przed przybyciem do Szkocji mieszkalam w malej meiejscowosci, na poludniowym wschodzie Polski. Przez kilka lat byl tam moj dom ale dluzej niz w tej miejscowosci mieszkam obecnie w Inverness. Dzisiaj popozostaly mi juz tylko wspomnienia z tego okresu. Nie mam wielu przedmiotow materjalnych ani zbyt wielu zdjec z tego okresu ani tez wczesniejszych zdjec, przepadly na zawsze. Stalo sie tak z powodu mojej decyzji o emigracji I z powodu mojego rozstania z mezem. Z posrod killku rzeczy ktore mi zaledwie zostaly szczegolnym sentymentem daze pamiatkowe kocyki moich dzieci ktore otrzymaly od swojej babci a mojej mamy, bo bardzo sie ucieszyla ze zostala poraz kolejny babcia. Moja mama zawsze kupowala kocyk z okazji narodzin kazdego wnuka lub wnuczki. Wszystkie kocyki moich dzieci a takze kocyki ich kuzynow sa w tym samym slodkim stylu a dominujacym kolorem jest niebieski. Sa cudownie cieplutkie, syna byl z pieskiem I sarenka a corki z misiami i napisem w jezyku anggielskim, chociaz babcia kupila je w Polsce. Ten typ kocykow byl bardzo popularny w naszym kraju kiedy moje dzieci byly malutkie. Mam w pamieci takze wspomnienie sanek, przyjechaly ze mna I z moja rodzina tutaj do Szkocji ale juz ich nie mam. Nie moge tej straty odzalowac bo nawet nie wiem kto je teraz ma a odbyly taka dluga I trudna droge. Byly to drewniane sanki, ktore przywiezlismy do Inverness dla naszych dzieci. Na tych sankach w dziecinstwie jezdzilam z moja siostra. Pamietam jak tato ciagnal je po ulicach Wroclawia bo tam mieszkalam w dziecinstwie. W Polsce zimy kiedys byly bardziej sniezne. Dzisiaj moje dzieci juz dorosly a ja mam te kocyki I tesknie za moimi sankami. Bardzo jeszcze chcialabym moc na nich chociaz raz zjechac z gorki z moja starsza siostra ale to sie juz nie zdazy nigdy, jaka szkoda… Na zdjeciu sa zaprezentowane takze szydelkowe aniolkowe ozdoby choinkowe wykonane przez moja siostre. Jak widac z mojej krotkiej historii czasami tesknie za moimi bliskimi co jest jak sadze bardzo naturalne I ludzkie. Before I arrived in Scotland, I used to live in a small town in the south east of Poland. It used to be my home for a few years but I've now lived in Inverness for longer than I had lived there. Today all I’ve got left of that period are my memories. I don’t have many objects or too many photos from that period or any earlier photos, these are gone forever. This is because of my decision to emigrate and breaking up with my husband. Of the few things I’ve got left, what I cherish in particular are my children’s commemorative baby blankets they got from their grandmother, my mother, who was very happy when she became a grandmother again. My mother would always buy a blanket every time another grandchild of hers was born. All the blankets of my children and those of their cousins were in the same sweet style and predominantly blue in colour. They are wonderfully warm; the one belonging to my son had a dog and a doe on it and the one for my daughter was decorated with teddy bears and an inscription in English, even though my mother bought it in Poland. This type of baby blanket was very popular in my country when my children were little. I also have a memory of a children’s toboggan which me and my family brought with us when we came to Scotland. I haven’t got it anymore. I can’t get over that loss and I don’t even know who’s got it now even though it survived a long and arduous journey. It was a wooden toboggan which we brought to Inverness for our children. My sister and I used to ride it as children. I remember my father pulling it along the streets in Wrocław where I lived as a child. There used to be a lot of snow during the winter in Poland. The photo also shows crochet angel Christmas ornaments that my sister made. As this short history of my life demonstrates, I miss my loved ones sometimes, which is a very natural human feeling. If you died would anyone notice? I’m from Hamelin, Germany – the town of the Pied Piper. I came here on holiday in 1997 when I was backpacking through Scotland. I started in Glasgow and travelled all over. It wasn’t my plan to come to Inverness because, for some reason, my travel guide about Scotland didn’t recommend it. I was almost influenced by this stupid book. I was on Skye and my plan was to go from there to Aberdeen. I thought to myself, ‘Why go so far? Why not stay in a town half way?’ So, I decided to stay in Inverness. I was very surprised when I arrived; I left the train station to see beautiful buildings outside. I stayed at a hostel close to Johnny Foxes, I think the Ho Ho Hostel is there now. At this time there was Balnain House, I spent almost a whole day there. It was so interesting to see all the instruments there. I walked around the castle and went to Johnny Foxes, where I had a pint and watched some German tourists shouting at one another. A lady came up to the bar beside me. She said something but I didn’t understand. I told her I was a foreigner and she said she was too. I didn’t know her accent, by a happy chance I guessed Liverpool and I was right. It was her daughter’s birthday so she invited me to join them for a drink. 21 years later, Teresa and I are together. For thirteen years we had the distance, but we stayed together. She moved to Hamburg to be with me but she couldn’t stay. In November 2011, I moved to Inverness to be with her. I love my life here. I don’t have to tell you about the weather… but I like it, it’s nice. The war started, I was with my mum in our own home, on our own. Bombing started at night time in our area. They destroyed our building, we didn’t know what to do so because my mum was ill, we decided we would run away and escape. Some people managed to escape but we saw dead people. We manged to find people to take care of us and they looked after us until the bombing stopped. When the bombs where coming down worse than before we manged to escape to my sister’s house. The situation was very bad then, we all stayed in a very small house with my sister’s family, my mother, brother and me, but what could we do we didn’t have anywhere else to go. The war was advancing there was shortage of food and water. Nothing was the same. For the whole three months with no electricity. At night time we used candles and spent months with very, very little food. There was no gas, electricity, air conditioning or heating. We had very little food but luckily there were some people helping give out food. We got a little bit of rice and some food which we had to make last for a long time. By the time the summer came there was a shortage of water. We had very little water and it was very hot and so we had to try to save the water, so we could only wash once a month. The war seemed to last for a very long time, there was continuous bombing. We developed a system, when the area started to get bombarded we decided to leave the house as soon as we heard the noises, we stood in the main door outside out homes. We would spend an hour, two hours waiting for the bombing to end. At least we had access to run away instead of being killed inside the building. It was a very difficult time. We were extremely nervous as you can image. We felt we could die at any moment. The problem was that my mum was very ill. During the bombing and at night time we were not meant to go out. One day mum was very ill, and we decided to go out because we couldn’t keep her in the house and so, my sister and I, took my mum away from the house to get medical help. We ran in to the street. We were aware that there could be bombing and snippers on the road. We saw some soldiers who asked us where we were going in the middle of the night as this is a very dangerous time. We said what else could we do, we needed to find a hospital for my mum. We spent about three years like this. This carried on for three year. This was especially difficult during the winter. When my mum was unwell we needed heating as she was an old lady and it got very cold. We didn’t know what to do with no heating. I managed to get coal from somewhere and I made a small fire to keep my mum warm. It was a very difficult time. We decided we had to do something, and we decided to leave for Turkey. We decided to cross the borders and we walked to Turkey from Syria. We manged to get access to Turkey and we stayed there for a while, however it was very difficult, and we suffered a lot. We had to work long hours and there was little for us to survive on. In Turkey our lives were very difficult. We had to work up to 15 hours a day. Our wages were very little, and we could hardly live on it. Even though people say the war has ended I think life is still very difficult for those who stayed behind. We have family still living there. Living the same life we lived and experiencing the difficulties we experienced. Water and food shortages are still happening. Even in Turkey life wasn’t good for us and we suffered. People are still living these difficulties and life was horrible for us. Then we realised we could apply to the UN office to find asylum in Europe or somewhere else and thanks be to God we got accepted, then we managed to come here to this country. We are very happy here and people welcomed us here very well, the only thing is I lost my mum and I was hoping my mum would stay longer with me. A honeymoon baby made in Scotland but born in England. Lived in Edinburgh, Glasgow and then The Highlands - my parent’s choices. Studied in Glasgow, worked in Wales, England and Scotland - my choices. Moved to Lebanon to offer physiotherapy for children who had none. Had packed 5 bags of luggage - carefully chosen over several weeks. Visa renewal declined by the government and forced to leave after several months. Definitely not my choice. Booked a plane to Jordan, reluctantly, in tears. Hoped to return to Lebanon one day. Worked with the same charity in Jordan but had left my heart in Lebanon. Invited to Iraq - would not have been my parent’s choice! Shared a taxi from Jordan to somewhere south of Baghdad. Loved the people, and children, who had never seen a white face, nor a physiotherapist! Iraqi militants kidnapped some colleagues and so we fled our home in fear of our lives, carrying one emergency bag that had been packed for weeks just in case. I stood in my room. What else do I choose to take? My favourite book? My laptop? My nicest clothes? Would I ever return? Choices made in 5 minutes. Our colleagues were held captive for two days, then released and we all left the country - our reluctant choice. In a land rover jeep, carrying one bag each. So, I chose to move. I moved to Iraqi Kurdistan. There I felt at home. There I was allowed to do physiotherapy and help as many children and families as I could. The one bag became at least 5 bags again! The years passed. I fell in love. I had freedom to choose who to marry. I had freedom to choose where to live. I chose Scotland. The circle is complete, but who knows where the journey may still lead. I am blessed to be able to choose and appreciate this privilege. I am blessed to have lived and moved amongst so many different peoples. I moved into their worlds and they moved into my heart. Should we not all have the freedom to choose where we move? It’s a tie to a sense of belonging. The object is a piece of driftwood I found in 1991. I was visiting a friend and ex-housemate who had moved to live on a farm in Bantry Bay, Southern Ireland. The piece of wood is smooth like driftwood yet was dug up in a field a distance from the sea. So it is something that has been shaped by movement and time. It’s not something I’ve thought of as having any value, yet it’s come with me wherever I’ve lived. It came with me from Cardiff to the Highlands in 1996. And I’ve moved a fair few number of times since moving here. More ‘valuable’ objects have been left behind. 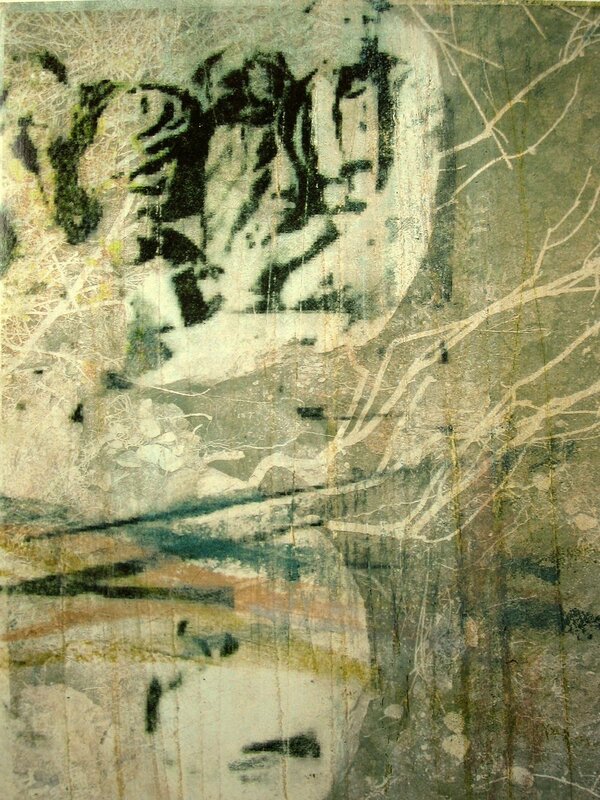 I think what it represents is a time when I moved from the Rhondda Valley, where I grew up, to the ‘big city’ Cardiff. It’s a tie to a sense of belonging, to a group of friends who came together for a few years, then shot off in different directions. We’ve all reconnected over recent years and picked up where we left off. We’re still friends, despite being spread across the British Isles, despite being different people, moved and shaped by time and tide like that piece of driftwood. - promoting racial and religious equality through community events and workshops which highlight our rich cultural diversity. “We all enjoy being part of Highland Multicultural Friends as we do just that - we make friends, share our culture and skills and learn new ones and find out about our new home in Inverness”. All welcome to join our organisation which meets at the Cameron Youth Centre Planefield Road Inverness. For more information telephone 07713160741. I’m proud to be part of the multicultural fabric of this country. Letter from Dr Junfei Hu to his solicitor. I am an immigrant to this country. Much of my life has been one form of immigration or another – moving from village to city, from small city to bigger city, from China to England, from England to Scotland. In China, my family moved to improve their circumstances; as an adult, I immigrated to take up an invitation to pursue academic study and improve my employment prospects in this country. I’m proud to be part of the multicultural fabric of this country. I don’t think there is anything wrong with me. I am eager to work and contribute. I have been contributing for the past 15 years and have earned the support and respect of many in my community. Scotland is my home. My community of support is here, my friends and colleagues. However, now the Home Office want to deport me. I do not know what is wrong with me. I have had some mental health challenges in my time but nothing that I have not managed to deal with. I believe my experience is valuable. In fact, it has enabled me to help others who are similarly challenged. I am also proud to have published a booklet entitled ‘Hope, Love and Peace’ (which was edited by my mentor Dr Michael Williams). My question is this: Could you raise my case with the Home Office and support my quest and right to become a permanent citizen of this great country? Thank-you. “Sometimes I lives in the country. Sometimes I lives in the town. The fire is lit; now the silence flares and crackles. That land should not be held. And be with you while I can. I am hopeful we will reunite again. Our struggle started in 2011, from the beginning of the war. The first year was okay, we managed somehow, but from 2012 the real struggle started. 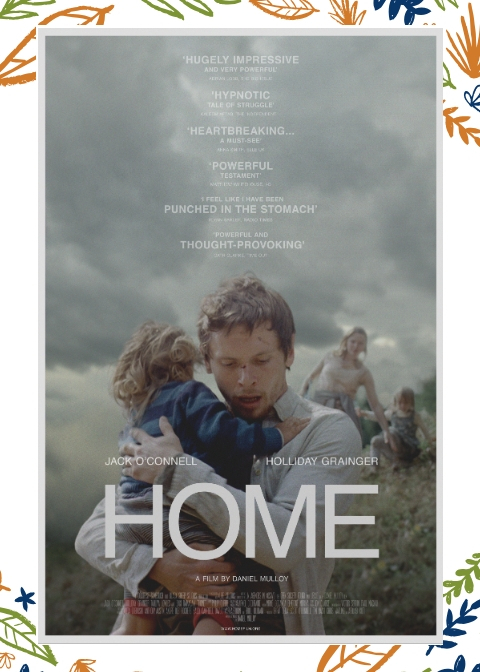 We had to leave our homes to find a safer place to live. We didn’t have security, we never felt a sense of being settled anywhere because we had to move from one place to another. There was lots of bombing and shortages of food, electricity, and water for 4 years. We had very little things to help us. There was no food at all in Aleppo; I don’t know how we survived. At one point, there was a complete lack of food for 3 months. We would think somewhere was safe and then it would get bombed. We would feel safe again then that place would get bombed too. We spent 4 years moving around. We stayed in Syria in a place where every day there was bombing. There were bombs in the street. Three buildings in our area were completely destroyed. There was no school, no food, no help. I was in a dilemma whether to stay, but lose my son, as there was a danger my son would be recruited with the army or the terrorists. I felt that, if I stayed, one of these forces would take him and there would be no return. I decided to leave this place and we went to Turkey. We stayed there for a while. It was safer, overall, however we felt very tired in Turkey because we had to work. We needed the money to survive. The kids had to work for long hours too, until we were blessed in registering our names with the UN. We were successful and they accepted us. My daughter is on her own in Syria. She has 3 options: to go to Lebanon, Iraq, or Turkey. However, there is no registration in these places anymore and it is very difficult to get to these places. I have thought about different ways to get her here, maybe with a visa, but it is very difficult. We are very happy here; the government workers and local people have helped us so much, no effort has been spared. We are not 100% settled because we still have our loved one living in Syria. My kids here are happy and going to college. I feel successful that I have brought them to safety, but we have left someone behind and she is on her own. I am hopeful we will be reunited again. Hopefully, we will find a way. We will try. Women belong to the ocean. In 2018 he voiced his concern. “I don’t want us to end. I could come to London, we would have to live together to be able to afford a place. I’d work in a bar and you’d find it easier to get work there than here in Liverpool. Women belong to the ocean, whilst the rest of the city sleeps. A seasamh air bòrd CalMac, a rainich fad an t-siubhal gach bliadhna a tighinn dhachaigh. Dachaigh. Caite a bheil thu? Chosg mi torr ùine air bòrd CalMac ann am beatha agam. A’ dol eadar dachaigh agus dachaigh. Bha mi daonnan a faireachdainn gun robh ruideigin air chaill. Ach de? Bha a h-uile sion agam, teaghlach snog, ceangal làidir le tìr agus muinntir, aite blàth le torr biadh agus pàrantan a bha blàth-chridheach, fialaidh agus caoine. Bha coimhearsnachd làidir mun cuairt, coimhearsnachd Gaidhealtachd. Carson a bha mi a rànaich gun stad gach triop air an aiseag? Carson a tha mi a faireachdainn cianalas airson aite nach robh riamh an dhachaigh “ceart” agam? Ghluasad mam ‘s dad mus robh mi breith. ‘S e Inbhir Nis an aite a rugadh agus thogadh mi. Carson a tha anail agam nuair a chuireas daoine an ceist orm; co as a tha thu?, ma tha? ‘S e Uibhist a’ Deas canainn nuair a tha mi a faireachdainn gaisgeil,dachaigh mo chridhe, dachaigh na sinnsearachd agam. Ach tha mise rud beag eadar dhealaichte, chan robh an cànan agam, ‘s e seòrsa uinneag a tha agam air aite, caitheamh-beatha agus muinntir air on robh mi ceangailte le fuil ach nach eil mi as coltaiche ri a-nis. Ann an cànan diofaraichte chan fhaodainn ag ràdh na rudan a tha mi ag iarraidh, chan fhaodainn a bruidhinn siùbhlach leis na daoine agad. ‘B urrainn dhomh a coimhead tro an uinneag, ‘b urrainn dhomh a coimhead tarsaing ach cha’b urrainn dhomh a gluasad air ais dhan àm sin. A-nis, de tha agam. Tha fios ‘s eòlas agam mu dheidhinn caitheamh-beatha airson a figh a-steach dhan beatha againn an diugh. Tha mi ag iarradh a gluasad air ais ann an àm ach tha sin cho fìor ‘s tha e neo-fhìor, tha beatha sònraichte agam an seo aig an am seo. De nì mi? Uill, bho am gu am anns na aisling agam nuair a tha mi cho samhach ‘s ghabhas thèid mi tro an uinneag agus togainn dealbh de mar a bha cuisean. Aig a h-uile àm eile gluaisinn leis an dealbh sin anns mo chridhe le bior agus snàth airson figh a-steach dhan ar beatha an diugh. Fhathast a gluasad troimhpe agus air ais. Dannsa Gaidhealtachd. Coltach ri dannsachan eile fad an t-saoghal, fad an t-siubhal. Srainnsear air gach taobh an uinneag. On board CalMac, crying the whole journey each year coming home. Home. Where are you? I spent a lot of time on board CalMac in my life. Going between home and home. I have always felt that something was missing. But what? I had everything, lovely family, strong ties with land and people, a warm house with lots of food and warm hearted, generous and kind parents. I had a strong community around, a Hebridean community. Why was I crying without stop each trip on the ferry? Why do I feel a homesickness for a place that was never my ‘proper’ home? Mam and Dad moved before I was born. Inverness is where I was born and raised. Why do I feel a space every time someone asks me; where are you from?, then? South Uist is the place I say when I feel brave, home of my heart, home of my ancestors. But I’m a bit different, I didn’t have their language, I have a sort of a window to a place, way of life and people that I am tied to by blood but that I am not exactly like now. In a different language I can’t say the things I want to say, I can’t speak fluently with my people. I can look through the window, I can look across but I can’t move back to that time. Now, what do I have? I have knowledge about the way of life to sew into our lives today. I would like to move back in time but that is as true as it is untrue. I have a special life here at this time. What will I do? Well, from time to time in my dreams and when I am awake and as still as can be I go through the window and look at the picture of how things were. All the other time I will move with this picture in my heart with a needle and thread trying to sew those ways into our lives today. Still moving through time back and forth. A Hebridean Dance. Kind of like dances across the world, all of the time. I’m a stranger on each side of the window. Each move I’ve made has turned darkness to light. I lived in Caithness until I was 20. I moved about in Caithness for more space and because dark times fell upon me after losing my dad. Looking for the positive side of life kept me going, as we moved through a couple of houses just to survive. I moved to Inverness with my partner for better work opportunities and a fresh start. Due to our oldest son coming we moved back to Caithness. The black mould in the flat was making me ill. Moving for our health was a big push. We lived in Caithness for 5 years. We moved twice in this period for more space. In 2015, we moved back to Inverness for better work opportunities and to do more than just survive. Our oldest son was struggling with school so for him the move gave him a better school. This new school helped him handle school better and he was diagnosed with autism. The school continues to be brilliant for him. Each move I’ve made has turned darkness to light by giving us what I didn’t have before. My item is handmade by myself and I choose it as it symbolises the path I have forged through the dark to the light. Robert came back at the end of term and plonked a pile of marking on the table. ‘Shall we go?’ he said. ‘Where?’ I replied. ‘To Tesco? Something big was going to happen. I come from Aleppo, Syria. I used to have a shop that sold nuts as well as a sweet factory. It was the second day of Ramadan, in 2012. My family had come together for a meal and we were all at the same house – it was just a normal day in Syria. I needed some stuff for the house so I went down the street. I was shocked to see there were no police or security, instead there were normal people – people dressed like normal people – but equipped with weapons. I knew something was wrong, that something big was going to happen. I decided to take my family out of the city. My wife was pregnant at that time. After 3pm you wouldn’t see anyone on the streets, only these people with weapons. We went back to our house after ten days to get more clothes to find everything had been stolen. It was close to the hospital and we heard an airplane, then an airstrike. It hit the building opposite our house. We fled. There was nobody left; all the houses in the neighbourhood were empty. When we left the area we found bodies on the road. A car had crashed on the road and the driver was left for days, nobody came to rescue them. The scenes around us were terrifying. All you could hear were gunshots. It was not the area I lived in, with the emptiness and the dead bodies: it was a ghost town. I used that hammer to build a new life. Wherever I’ve moved, Inverness included, I have used that hammer. I’ve used it in the most literal sense: building. I’ve made money from it making things for people when I moved here from the Borders. I suppose if you want to get philosophical, I used that hammer to build a new life. I found living where I grew up, with my original family, did not allow me to be ‘me’. I came to Inverness and met friends who I can by myself with. I reinvented myself. I’ve been sort of adopted by my friend’s family and now, I’m me – I’m Sam. All those preconceptions you can leave behind. You can be yourself. I am originally from Syrian, I am an ordinary woman from Syria. Our life in Syria was extremely different from our lives here and outside Syria. In Syria the ordinary role, or the main role, of women was to look after their husband, to look after her children, to look after her home, that was my job and my role. Because of the war we had to escape, we had to leave. It was very difficult for all Syrians. Especially for us because we experienced an attack on our own home. There were explosions and bombings. My husband was really scared and terrified about what could happen to our children and he didn’t know what to do. He said to me that we needed to find a safe place for the children to live. We left Syria and we chose to go to a safer place in Egypt. I thought it would be similar life style. My husband would be working, and I would be looking after the kids. However, life was very difficult, and we couldn’t keep those roles up, I had to look for jobs and before I found a job my husband died. After my husband died I was unable to cope with out a job. I had to go out and find a job. I managed to find several jobs and I tried to balance between my children, home and my work. However, life was very difficult financially. It was very difficult for everyone in Egypt but especially for us, so the kids had to go to work. They had no schooling at all. I had to work, and the kids had to work so we could survive. It was very difficult. There was no schooling. I was unhappy because my children had to work and had not been going to school. I though the best way to deal with this was to stay in Egypt for 6 years and every year I went to the UN office to find security and financial support, so my children could continue their education. I was terrified for their safety especially of for my daughter when living in Egypt. I would not let her go outside alone. She came with me or would take a taxi anywhere she went. We struggled hugely during this time. I was praying for a solution and eventually I was offered a place in Scotland, here in the Highlands and manged to come here. We were blessed to come here. We were happy we were contacted by the UN office and we thought all our struggled would end because of going to a European country that could support us in terms of schooling and help and security however as much as I was happy I was also sad because I am separated from my mother who lives in a different European country. As much as I am happy to be safe we are still not together as a family. Although we are very happy to be here and thankful to the team that looked after us and we are generally settled here however we know every refugee has left behind someone that is very close to them a father, mother, sister, daughter and they are not going to be happy and settled because we know their struggles. Even when we eat, when we have good times, they are not happy overall because their loved ones are struggling elsewhere. My story seems like it ended nicely. However, my mum’s story is still bad, she has suffered so much as a refugee. She lost her home in Syria, she went to Egypt, she got to Sweden and Germany and lost her status in Germany so cannot stay there and she is now in-between not knowing where to go. I can’t go to her and she can’t come here. I know that my mum is not happy, and she is not settled, and her future is very unclear. We have a sense of helplessness because the visa conditions for people, like my mum, to come to live in the UK is very difficult. I am still optimistic that my mother’s story will end in a good way, like my story ended in a good way. Life treated me really well and brought me here and made the journey easy for me and hopefully life will decide the same for my mum and hopefully she will also settle somewhere where she feels settled. I brought my family here and worked here, and enjoyed it all. I was born in Liverpool and later married there. Times were hard for all industries; strikes were abundant. It was the 1970’s and the government were cracking down on us. There were blackouts. People sitting in candlelight. It was getting worse and my husband needed to find steady work. He travelled to the very far north of Scotland to get a job in the oil industry. My children and I followed him there, to stay in Alness, until the end of his contract. We lived there for just over ten years. Eventually, we divorced. I got remarried to a man who also worked in the oil industry. We moved to Inverness in 1990 and we’ve been here ever since. That’s it really. I brought my family here and worked here, and enjoyed it all. It’s a beautiful area. When I first came here I was blown away by how beautiful it was, it was such a contrast against industrial Liverpool. I have no plans to leave. My story of movement, relationship and creativity all go together. During a period of transition in my life I was in a situation where I moved home five times over the course of two years – in and around Inverness. Thankful to be in a safe country where I could access private rental accommodation for myself and children. It can be a stressful time packing and moving, but the thing that always helped me to deal with the uncertainty and physical uprooting was my connection to creative people. It was in my relationship with my creative community that I found inspiration and invigoration and a safe place to be vulnerable. Carving out a space to create in was more challenging in some rentals than in others, with the practical limits of space but where there is a will there is a way and all part of my growth and healing. My painting ’Serendipity’ is an expression of my question to myself over the existence of chance in the connections made with other creatives along the way. Some of those connections remain as lifelong friends, others are small connections or a moment in time that provided the right words or music that spoke to my spirit. But all just as important. For me, collective creativity produces community. Creative expression connects people inclusively and regardless of sexuality, age, ethnicity, class or religious belief. You could be anywhere in the world and find creative people to be with just to create with. The exhibition ‘Stories of Movement’ aims to encourage people to think in new ways about migration. This exhibition offers people the opportunity to reflect on the many ways in which movement occurs and that, fundamentally, everyone has a story of movement. The HiMRA team want to create an ever-growing gallery of your stories. Your submission will join the Stories of Movement gallery as part of an online gallery. 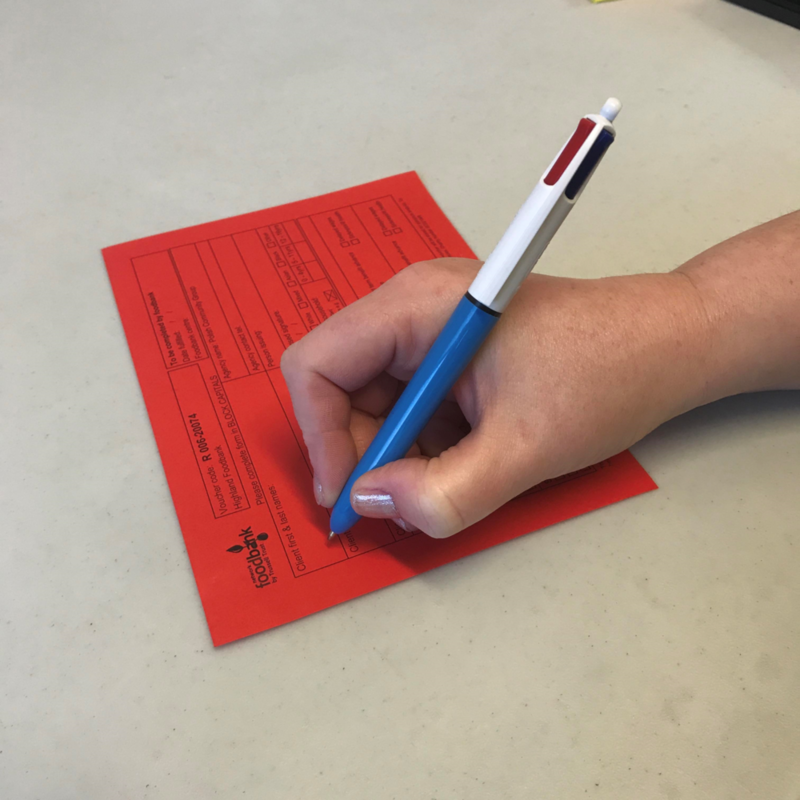 You can submit as an individual, a family or a group. There is no restriction on who can submit. We want to hear from anyone and everyone because everyone has a story to tell! Please submit any image that you feel illustrates your story. We can accept photos from mobile phones up to high resolution images. 250 – 400 words in a Word document. This could be a journal or your travels, a poem, a tail from your country of origin or your feeling and the experience connected to your object and your personal story of movement, whatever you choose to share. Please feel free to submit in your first language along with an English copy, where possible. Where this is not English we will endeavour to translate into English. Your text will be displayed in both languages. To submit large images, we advise using the website www.wetransfer.com for better image quality. Along with your submission please include.